Previously, the reproduction of CDs, DVDs, HD-DVDs or Blu-ray discs, was done by pressing the data to a master using a laser. A thin layer of nickel is galvanised to the sili-con or glass carrier (substrate) in a galvanising bath. This process is controlled by using the time and current values based on previous experience. Therefore, for precise bath control, the thickness measurement values must be accurately measured. The nickel plate produced in this way, also called the “master” or “father” is separated from the carrier. Depending on the number of copies that need to be produced, the „father master“ is sufficient for the injection moulding process. The die thickness must be 297µm ± 3µm. In the case of a higher volume of copies, a “mother master” is produced from the “father master” by further galvanising processes, from which 10 or more “stampers” are then manufactured. The individual dies and stampers are often subjected to close examination between stages of production so that any errors produced during galvanising are eliminated. Therefore, the thickness of the die is a critical factor for quality. ISEDD GmbH based in Bielefeld, Germany has developed inspection systems for this very purpose, which enable fast and accurate thickness and profile measurement of dies. Using this device, the thickness at each point of the die can be measured. The data obtained can then be used for reliable control of galvanising baths. 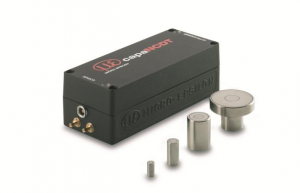 Capacitive sensors from Micro-Epsilon are used to mea-sure the thickness and profile. 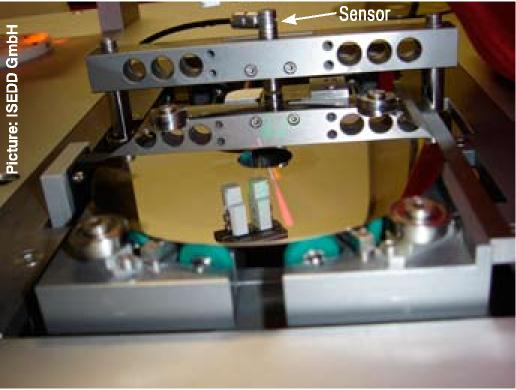 One sensor is positioned above the die and another below the die, which is moved between the sensors during measurements. The die can also be rotated in order to measure thickness profile or several measuring points can be made for a defined cir-cumference. Using the two distance values, the thickness can be de-termined very accurately by using the differential method. The capacitive sensors measure the distance to the die at a measuring frequency of 2kHz and with nanometre re-solution. CS1 sensors with an extended 2mm measuring range are used. Extreme precision is achieved by using software post-linearisation. The measurement results are displayed graphically as a thickness profile across the measured circumference, the measured segments or other defined measuring processes. The evaluation contains the maximum and minimum thickness, the average thickness, the standard deviation and degree of variation.